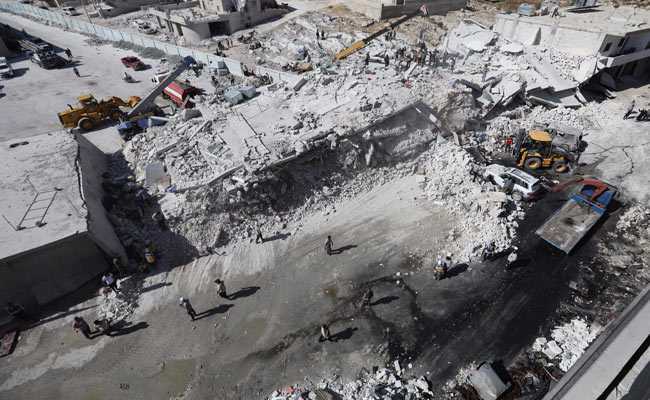 An explosion at an arms depot in a residential area in Syria's northern Idlib killed 39 people . An explosion at a weapons depot in a terrorist-held town in northwest Syria killed at least 39 civilians including a dozen children on Sunday, a monitor said. He said most of those killed were family members of fighters from Hayat Tahrir al-Sham, an alliance led by terrorists from Syria's former Al-Qaeda affiliate, who had been displaced to the area from the central province of Homs. Most of Idlib is controlled by terrorists and Hayat Tahrir al-Sham, but the ISIS also has sleeper cells in the area. In recent months, a series of explosions and assassinations -- mainly targeting terrorists -- have rocked the province. While some attacks have been claimed by ISIS most are the result of infighting since last year between other groups. President Bashar al-Assad has warned that government forces intend to retake Idlib, after his Russia-backed regime regained control of swathes of terrorist-held territory elsewhere.